b) One who is full in all respects. The nAma is derived from the root viS - to enter. ViSvam means "Universe". They say BhagavAn is viSvam because He enters all the worlds. (The worlds themselves are called viSvam because of this). SrI BhaTTar interprets the term "Worlds" or "Universe" here to denote entirety. He points out that it is quite fitting that the first name of vishNu in SrI vishNu sahasranAmam suggests His immense glory, the fullness to the brim of His essential nature, form, qualities, etc., which are all natural, unexcelled, auspicious and superior. SrI v.v. rAmAnujan adds that this completeness is in respect of His rUpam, svarUpam, guNam, and everything else. 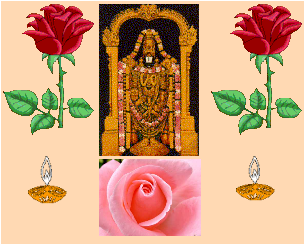 He quotes nammAzhvAr - uvaryaRa uyar nalam uDaiyavan (tiruvAimozhi 1.1.1). It is to explain this aspect of the fullness of bhagavAn in every aspect that the remaining 999 nAma-s follow the nAmA viSvam, thus emphasizing the deep meaning embedded into this first nAma as denoting bhagavAn's fullness in all respects. SrI Samkara views that bhgavAn who is Brahman or the Supreme Person created viSvam and is therefore, called viSvam. Brahman is the kartA or the Creator here (the Cause), and viSvam is the creation or the effect. Because the Cause who is Brahman is being called by the nAma viSvam which is the effect, this is used by advaitins as an argument to say that effects are nothing different from the Cause, and everything is Brahman. In other words, the argument is advanced that Brahma who is the creation of vishNu, can be praised as an appropriate form of vishNu. SrI BhaTTar points out that the two terms, brahman and viSvam, should not be taken as referring to their being identical. viSvam or Universe is just a mode or extension of bhagavAn, as are the other 999 nAma-s.
SrI vedAnta deSikan in his commentary on tiruvAimozhi, observes: "To regard Brahman and World identical is samAnAdhikaraNya to which AzhvAr does not subscribe. The world is the prakAra or vibhUti of the Lord. He is the cause, sustainer, controller, and the soul of all things and beings". SrI cinmayAnanda explains the nAma "viSvam" by referring to the viSva rUpam or virAT purusha. He refers us to SrI vishNu purANam - sa eva sarva bhUtAtmA viSva rUpo yato avayayah - (vishNu purA. 1.2.69). He is the soul of all that exists, and everything is His body. SrI satyadevo vAsishTha interprets the nAma viSvam or "Universe" as indicating that everything in this Universe came from Him, and also everything in this Universe goes back into Him. So in both senses, He is "viSvam". It should be noted that the words viSvam is in the neuter gender. SrI BhaTTar points out that it still is a nAma of vishNu, representing His guNa of absolute fullness and power. Consistent with this, the nAma to worship is "viSvAya namah" as adopted by the viSishTAdvaita school. The Samkara school uses the form as "viSvasmai namah". The nAma indicates His Fullness in all respects; the succeeding 999 nAma-s all elaborate on this first nAma - the Fullness of Him in all resepcts. Nothing in the Universe exists without Him, and everything in this Universe ultimately finds refuge in Him, and in this sense also He is viSvam or "Universe". a) One who permeates everything, is inside every sentient and non-sentient being. b) One who surrounds everything. This nAma occurs again as nAma-s 259 and 663. This nAma can be derived from the root vish - vyAptau - to pervade, or vis - praveSane - to enter. SrI BhaTTar's vyAkhyAnam is - sva vibhUti bhUtam cit acit Atmakam sarvam viSati iti vishNuh. The idea is that keSava exists everywhere and permeates everything that is His Wealth; He is unlimited by space, time, and substance - (SrI Samkara); He pervades the whole universe internally and externally. SrI BhaTTar gives the following references in support. tat srshtvA | tadevAnuprAvisat - Having created it, He entered into the same. "KeSava exists everywhere having pervaded all these worlds. Therefore His name is VishNu since the root viS denotes entry i.e., pervasion". Under nAma 259, SrI BhaTTar explains vyApti (pervasion) further, and explains the relation between bhagavAn and the jIva-s as of the nature of the relation between fire and smoke. When there is smoke, there is fire, but the reverse is not always true (as in the case of a red hot iron rod). Thus, bhagavan and the jIva-s are related in the sense that without bhagavAn the jIva-s do not exist. The supreme Person and the jIva-s are never identical, but there is inseparable connection between bhagavAn and the rest. He is greater by virtue of the diverse kinds of help He renders to all who are of a lower order. SrI BhaTTar refers us to the gItA - na tadasti vinA yat syAt mayA bhUtam carAcaram (10.39) - "There is no object, moving or non-moving, which can exist without Me". Another anubhavam of this guNa of vyApti is that it is not just the fact that He is in everything and in inseparably bound to everything, but it is one of His showering everything with His infinite Mercy (SrI v.v. rAmAnujan). His sauSIlyam is to be enjoyed here. SrI kRshNa datta bhAradvAj derives the meaning from the root vishu - sechane - to sprinkle, to pour out; veshati (si'nchati) bhakta tarUn ASIrvArIbhih iti vishNuh. The Lord created the five elements, and from them He created all others. Indeed He became all others. He pervades everything in and out. He is the Soul for the body of everything and every being. The term "He enters all the worlds" should be understood as "He enters everything in all the worlds". SrI rAdhAkRshNa SAstri gives another view of the reason why bhagavAn has pervaded everything. It is for the purpose of ensuring that everything is in its designated and assigned place, and things don't come into collision with each other - for example, the different planets and constellations etc. He quotes from the taittirIya AraNyaka, wherein first the question is asked - keneme vidhRte ubhe - "Who is keeping the two things from colliding with each other? ", and responds: vishNunA vidhRte bhumI; iti vatsasya vetanA - "vishNu is the One who is supporting them with His Sakti; this is the finding of sage vatsa". nArAyaNa pervades the whole universe externally and internally. He is named vishNu, from the root viS - to enter or pervade." "As I have pervaded the horizons, my glory stands foremost, and as I have measured by my steps the three worlds, O Arjuna! I am named vishNu". SrI anatakRshNa SAstri interprets the term kAnti here as referring to His Effulgence - His radiance pervades the firmament and transcends it. SrI BhaTTar has given the explanation of the nAma vishNu in terms of His power of pervasion (Sakti) under nAma 663. He refers to the mantra about bhagavAn: sarva SaktyAtmane - He, Who is the embodiment of all powers. He also gives reference to the Slokam: "yasmAd vishTamidam sarvam tasya SaktyA mahAtmanah." given earlier. As an instance of this Sakti, the trivikrama incarnation is also cited - the smRti declares "vishNuh vikramaNAt devah" - mahA bhA. udyoga. 5.68.13), a reference to His name being vishNu because He measured the three worlds with His steps. "He changed me from a nitya samsAri to a nitya sUri; He exterminated all my sins, those of my predecessors and my successors for several generations, so that all of us have reformed to become His. Who did this? VishNu! He will do this because His name implies all-pervasiveness". SrI BhaTTar interprets the nAma-s kRtAgamah, anirdeSya vapuh, vishNuh, and vIrah (nAma-s 661 to 664) as indicative of His being the Lord of Sakti. Everything that exists in the universe is nothing but of the nature of the Lord, and without Him nothing exists. He pervades everything, unlimited by space, time, or substance. SrI kRshNa datta bhAradvAj gives an additional interpretation not found in other vyAkhyAna - s: vi + shNuh = vishNuh - viSesheNa snAvayati prasrAvayati bhakta abhilAshAn iti vishNuh - He who bestows the wishes of the devotees, like a fountain. Note that the root from which the second nAma is derived is the same as the root from which the first nAma - viSvam - was derived. However, the interpretation is different. The interpretation here is that BhagavAn has entered all beings - sentient and non-sentient, that He has created. The meaning for the first nAma was that bhagavAn is everything, the Absolute, full in all respects. the first nAma emphasizes His Fullness and Perfection, and the second nAma indicates that He permeates everything. SrI rAdhAkRshNa Sastri observes that meditation on the significance of the first two nAma-s - namely that Lord vishNu is in everything around us and in every one of us, and that without Him nothing exists, will lead us closer to a life of peace, tranquillity, ahimsA, and selfless service to Him. Sri Surin, in his commentary on amara KoSa, has given the following derivation for the word VishNu - veveshti iti vishNu: - One who surrounds and envelops. This is derived from the root word vesht - to surround (recall the word veshti in Tamil for dhoti, which surrounds!). One interesting question that can be raised is: Given that the stotram is called visNu sahasranAmam, why did Sri VyAsa not start the stotram as vishNur viSvam vashatkAro, and instead chose to start it as viSvam vishNur vashatkAro..? Based on the SrI BhaTTar's anubhavam, viSvam is the name that symbolizes the primary attribute of the para form as one of shAdguNya paripUrNatva, and vishnu and the following names then elaborate on the name or the guNa represented by the name viSvam. SrI satyadevo vAsishTha rhetorically asks the question: If Lord vishNu is everywhere, in everything, why is it that most of us don't see Him? The key is the SraddhA. He who is endowed with the sAttavic disposition, or has developed it, keeps seeing vishNu in everything around him all the time. - the nAma vishNu refers to the guNa of bhagavAn in pervading everything He has created, including all sentient and non-sentient objects from a blade of grass to brahma; - His pervasion is because of His Sakti; in other words, He is the power behind everything that exists; an instance of His Sakti is illustrated by His measuring the three worlds with His Foot; - His vyApati is indicative of the inseparable relation between Him and everything else outside Him, in the sense that nothing exists without Him. - His pervasion of everything is of the form of His enveloping and showering everything around Him with His Mercy. It is not just His sausIlya that is indicated by this nAma; all His powers including that of creation, sustenance, His Lordship, etc., are to be understood by this nAma. - It is because of His pervasion of everything in this universe that things (for example the constellations, the planets, etc. )., are in their respective positions without colliding with each other. - He is also called vishNu because He bestows the wishes of His devotees profusely like a fountain. One who controls and directs (not merely pervades). Sri Bhattar interprets the names VishNu, vashatkAra, and bhuta-bhavya-bhavat-prabhu, as additional elaborations of the name visvam. The root of the word is vas - to control as He wills. It should be noted that Sri Bhattar has pointed out in his commentary for visvam that BhagavAn is everywhere with His shAdguNya paripUrNatva WHICH IS NATURAL TO HIM, in the commentary for vishNu that He permeates everything that HE CREATES AND POSSESSES, and in the current one for vashatkAra that He controls AS HE WILLS. Thus, all these guNas are not something that have been acquired or imparted by something external, but this is His will and schema. * sarvasya vaso sarvasya IsAna: - He is the Controller of all and the Ruler of all. * jagadvase vartatedam - The Universe is under His control. The summarization from Nirukti is svecchayA yo sarvam vase karoti sa: vashatkAra: - One Who controls and directs everything and everyone as He wills. Sri Sankara provides a very different interpretation for this nAma. He points out that BhagavAn is Himself the vashatkAra mantra, where vashat is a sacred sound (similar to Om, svAhA, etc). used on sacrificial offerings. It is also used in the anganyAsa and karanYasa practice before chanting the sacred slokas (e.g., sahasrArchis saptajihva iti saktyai sikhAyai vashat). Note the similarity of vashatkAra to Om kAra, a word with which we are familiar. VashatkAra is thus a mantra, and BhagavAn is the mantra svarUpi. The explanation in terms of BhagavAn having control over all His creations is appealing because of the continuity it provides to the interpretations of the previous nAmas. The Master of all things past, future, and present. Nirukti - trikAla vartinAm seshi - The Lord of all things that exist in the past, present, and future. From the srutis, we have "bhUta-bhavya-bhavan-nAtha: kesava: kesi sUdhana: " - Kesava, the slayer of Kesi, the asura, is the Lord of past, future, and present. The idea that BhagavAn is beyond the physical laws as we know them, such as the laws and constraints of time, can be inferred from this nAma. In order for Him to be the Lord of all things past, future, and present, He existed before anything existed, exists now, and will exist forever into the future. ..Thus the well-known and established physical law that all living things come to an end does not apply to Him. He is beginningless and endless. Sri Bhattar has explained that the nAmas 2, 3, and 4 elaborate the first nAma by indicating how the All-pervading vAsudeva is in everything living and non-living, controls everything, and is the Master of everything past, future, and present. He now proceeds to explain the next 5 nAmas as further expanding on this last aspect - how He is the Master of all things past, future, and present. We will see that this is so because he is the creator of all beings (nama 5), the supporter of all beings (this nAma 6 seems to be further elaborated by nAmas 8 and 9), has existence independent of any other being and as the Lord or Director of all that exist (7), supports all that He has created by being their antaryAmi or inner soul (8), and supports by nourishing them and growing them (9). Sri Bhattar points out that this act of creation of is done by Him without dependence on anything external. bhutAni karoti iti bhUtakrt - One who creates all the beings. "sa visvakrt sa hi sarvasya kartA - He is the creator of the Universe and all the beings in the Universe. "tvam kartA sarva bhUtAnAm" - You are the Creator of everything that exists - VishNu PurANa 1-4-15. The supporter of all things. Sri Bhattar explains that this support is like that of the support at the center for a wheel and its spokes. If this central support does not exist, the rest of the spokes and the wheel collapse. Thus, one can think of this support as the responsibility for the existence of all the things that He creates. This support is in the form of being the inner soul or atman of all beings (nAma 8 below), and as the One who nourishes and protects all beings (nAma 9 below). Sri Radhakrishna Sastri in his work on Sri VishNu sahasranAma explains this support as that provided by Adi Kurma to support this universe, or by Sri VisNu as varAha mUrti when he retrieved and bore the world. Sri Sankara interprets nAma 6 above as referring to the acts of creation or destruction ("bhUtani krtanti krNoti hinsti iti bhUta krt), and nAma 7 as referring to the act of sustenance, in the context of the three functions of creation, sustenance, and destruction. He who exists always, independent of anything else. This nAma is derived from the root bhU (bhavati) - exists. Sri ChinmayAnanda gives the derivation: "bhavati iti bhAva:"
All things are His body, and He is the soul of all things. The soul enters the bodies, and directly controls and directs all their activities. The Lord is the soul, the antarYamI or inner ruler of all beings, and amrta or never ceasing to exist. The One Lord manifesting Himself as the souls of all beings who have different external forms. One who nourishes and nurtures all beings that He created. is vardhayati - makes them grow - the act of nourishing is emphasized. He is bhUta-bhAvana because He makes all things grow by bestowing on them things that sustain them, nourish them, and contribute to their enjoyment. He makes them shine (bhA - to shine), generates or invigorates, and makes them grow. With this, we have concluded the first sloka out of the 107 slokas. We notice that Sri Bhattar has beautifully brought out the continuity in the description between the 9 nAmas covered in this first sloka.